Among other things, your author bio on Amazon states that you were: “once a Metropolitan Police Officer who was arrested for attempted murder.” WOW! Will that story ever be the basis of a novel? No, I’m too ashamed. I reacted to a bad situation in an uncontrolled, thoughtless way with no regard to the repercussions. If I had killed that person, who had started all the trouble, then I doubt I would be here today. I think all kinds of vigilante stories have been told one way or another. 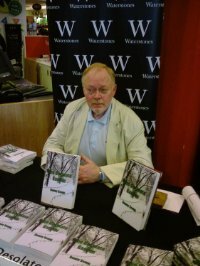 For your debut novel, The Desolate Garden, you had a four month signing arrangement with Waterstones – they’re huge! What was the experience like? What were some of the interesting-funny-weird things you encountered among readers and fans? They were very tiring, because of the travel involved. My wife came with me and we would have to leave home, for some of them, at five in the morning, driving over two hundred miles to arrive. We had fun though, but I wouldn’t have liked to have gone on my own. People generally were kind and conversational, which helped because both of us love a good natter. One time sticks in my mind, and I don’t think it will ever leave. I was on a special crime book signing tour with Lee Child and John Connolly at Waterstones in Nottingham. The staff there had laid out a lovely decorated table, with the novel displayed in front and to the sides, with vases of flowers framing me, seated in the middle. I had just sat down, when lady approached, and picked up a copy of The Desolate Garden. I said “good morning madam, how are you today?” She dropped the book stepped back in a distinct hurry, and said in a loud voice: “Don’t speak to me. I do not like being engaged in conversation. Just sign a book and I’ll be gone. Be quick before I change my mind.” Oops, I thought, hastily gathering up my pen and scribbling a signature without asking if she wanted her name in there! The Desolate Garden will start filming soon; how cool is that? Did you always envision that your book would eventually be a movie as well? No, I’m not that imaginative nor bigheaded. I did dream that it would be a best seller though. Don’t we all? On hold, (laugh) and has been since The Desolate Garden was published. The title is Mitzy Collins. I am in by about 56,000 words and add notes now and again just to keep my mind, and the direction, going the right way. When the film is started, and I get paid, then I’ll carry on, until then I just can’t. My concentration is on marketing and promotion of the novel that’s out there. Mitzy is a twin, grows up in London in the eighties and becomes a professional photographer. She gets involved with people who know about the death of a young girl.......I’m saying no more! Writing and being a writer are wonderful in so many ways, but it’s not all razzle-dazzle! What is the one thing that frustrates you about the worlds of books and manuscripts and publishing? Twitter, without a shred of doubt. It is the most wonderful means of promotion and free advertising open to us, but it is so time consuming and, in the most part, boring as hell must be. I retweet hundreds of people on there, and in turn, bless their collective hearts, they retweet me. So the circle keeps turning. The more I retweet, the more retweets I receive and the more I then have to do...........infinitum. Deceit and espionage! Double agents and double crossing! What impact do you think the internet - more specifically, sites such as Wiki Leaks – have or will have on the espionage genre? I honestly don’t know. The secretive industry is an ever growing one, particularly with the internet where trillions of money is invested. I only envisaged writing one novel about spies. The Desolate Garden has espionage at its core but it is not just that, it is romantic and historical. I love writing with a woman as my main character, women fascinate me more than anything else in life. What’s one of the worst bits of writing advice you’ve ever heard? ‘Write about what you know.’ In my opinion, only applicable if it is autobiographical. Whatever happened to imagination? Did Charles Dickens experience all of what he wrote? He may have seen the poverty that he used as the background, but he used his skills at story telling to write. What one piece of advice would you offer to an aspiring author? Do it, write your story then stand back and watch. Imagine your completed work on a shelf in a book store. Then see, in your mind's eye, a stranger lift your book up, glance through it and then take it to the check-out, pay for it and take your creation home to read. Nice thought? If you want to share it, then go write. If your house were on fire and you could only save three books, which ones would you save and why? My cheque book, my savings book and my address book.........Do I have to say why? Do you think people who read on Kindles or Nooks or Kobos, etc. are as engaged as/get as into a work of fiction as those who read paper versions? Again Jill I can’t really answer this as I have never read from a Kindle, nor have I that application on my computer. Life is changing all around us, and perhaps the storage of physical books, at home, is a thing that will slow down and perhaps die away. I would hate to think that a hard cover book will cease, as I personally prefer that to a paperback. I have no doubts that the engagement between a reader and a writer is affected by electronically downloaded books. With the holding of a printed novel comes the heart and soul of the novelist. Is that too romantic to print? The last question is a bit of a freebie: What is the one question you wish I had asked you, but didn’t? Now go ahead and ask and answer that question. 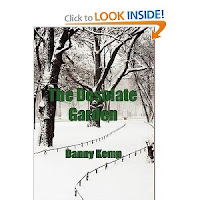 Check out The Desolate Garden on Amazon - click HERE. Or check out Danny's website HERE. Jill, Your interview with Daniel (Danny) was interesting and intriguing, especially the opening. Hmm... His background is both fascinating and mysterious just like his book. Enjoyed it.